Pigeonepea (Cajanus cajan (L.) Millsp.) is a perennial erect bush, 0.5 to 4 m tall, and has strong stem. It has pubescent leaves which are trifoliate. Leaflets possess vesicular glands below, which are membranaceous or rather tick. Stipellae are present or absent. Flowers are present in axillary or terminal pedunculate or almost sessile racemes. They are yellow, or lined with red, or flag is dorsally reddish, and upto 3 cm long. Bracts are small or large, caducous; bracteoles absent. Calyx are teeth acute, acuminate or elongate-acuminate; two upper ones more or less connate. Coralla are persistent or not, vexillum obovate-orbicular, reflexed, clawed, auriculate. Wings are obliquely obovate auriculate, keel rounded-oblique, obtuse. Ovary is subsessile with 3 to 10 ovoules. Style is thickened above the middle, upcurved, upper part glabrous or slightly hairy, not bearded. It has 9 stamens which are connate; vexillar is stamen free and anthers are uniform. Its fruit is a pod, linear-oblong, apex obtuse or acute, compressed, bivalved, depressed between the seeds with transverse lines, more or less septate between the seeds. Its seeds are reniform to suborbicular, shiny, white, brown, grey, purple or black, variegated or not, strophiole conspicuous or vestigial. It has deep, strong, woody tap root with well developed lateral roots in the superficial layers of the soil. It is nodulated by the cowpea group of Rhizoibum. Most nodules may vary from 2 mm to 2 cm, and the shape be spherical, oval, elongate, or branched. 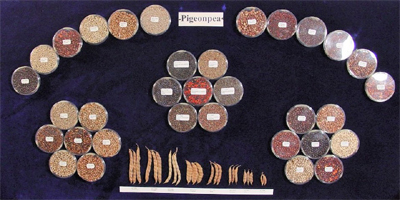 Pigeonpea seems to have originated in peninsular India. It is part of many farming systems throughout the tropics and sub-tropics. Pigeonpea can be found growing on an otherwise arid landscape due to its ability to tolerate drought and high temperatures. Its deep root system allows for optimum moisture and nutrient utilization and break the plough pans, thus improving soil structure. It seems to have special mechanism to extract phosphorous from some soil to meet its needs. It depends on symbolically fixed N part of which (up to 40 kg N ha-1) is left as residual for the use of following crops. Its fallen leaves enrich soil organic matter. This crop is ideal for intercropping or mixed cropping because of its slow initial growth allowing companion crop, usually a coarse grain cereal, to grow unhindered. Click here for Taxonomic classification of Cajanus sps. © 2018 - ICRISAT Regional Genebank, Niamey.